Cheers to savoring the good things in life. I’m taking a sight departure from my Irish Travels posts, but don’t worry, I’ll finish telling you about the rest of our trip soon. I realized there have been things I’ve been wanting to try in the kitchen for a while but just haven’t got around to, so I decided it was time to make something happen. Behold! You might have noticed that “can something” is crossed out. That’s because I have actually canned three somethings! 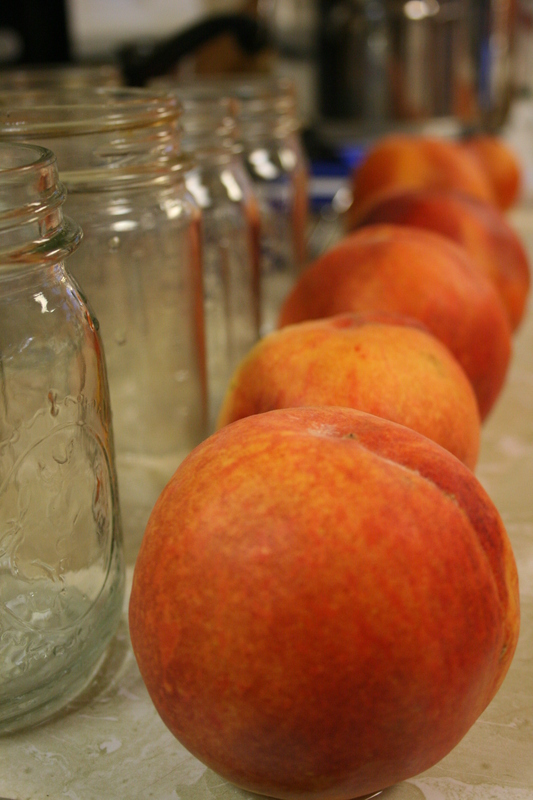 I’m going to share about canning peaches in this post but I’ll be back soon with details on canning applesauce and tomato sauce. I like buying produce locally. I like knowing the farmer who grew it and I like knowing that it didn’t spend days on a truck coming from God knows where wasting countless gallons of fuel to get to me. Locally grown food is fresher, tastier, and better for the local economy (and the environment in a lot of ways.) 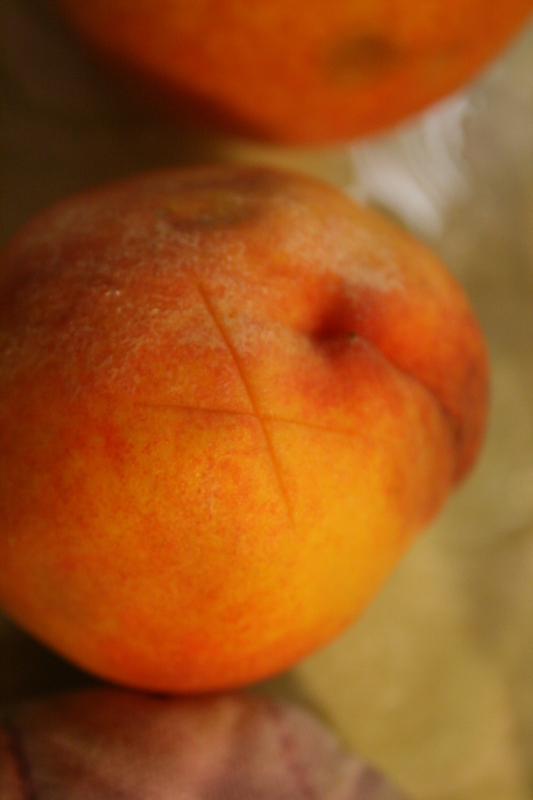 Just because you can buy peaches in January at the grocery store doesn’t mean that they’ll be any good. Canning is a way to preserve seasonal deliciousness for times of the year when these types of produce aren’t available locally. I like to buy my fruit from Bill of Mickley’s Orchard and Farm Market in Biglerville, PA at the Farm Fresh Market. If you are looking for a market near you, check out local harvest. When you buy from a local farmer you can ask if they have any “seconds” available which might have bruises or be oddly shaped. When you’re canning you can always cut soft spots off, no problem, so buying seconds can save you a few bucks. Now that you’ve got some yummy, ripe peaches, you’ve got to get those babies peeled. Cut an x on the top and bottom of each peach then blanch before peeling. Keep organized-I had my peaches blanching on the front left burner, my syrup cooking on the back left, canner ready to go on the front right, and (can’t see it but) lids going on back right). 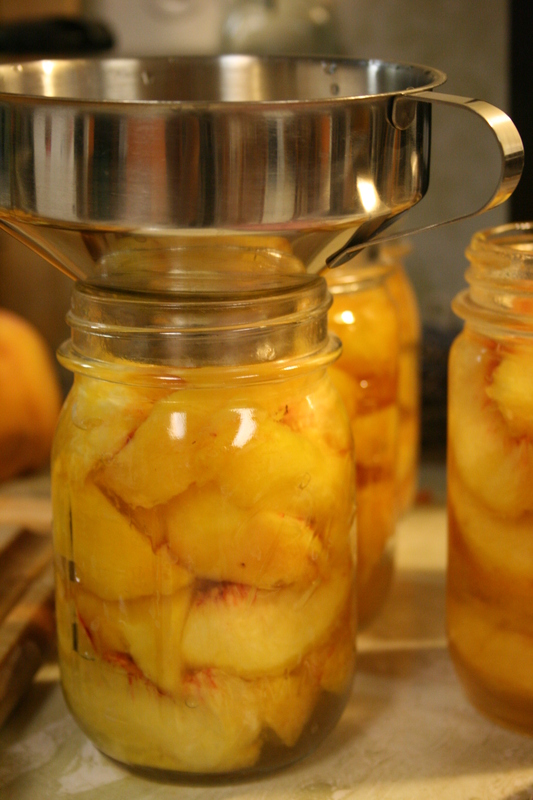 Pack the peaches in the jars tightly, and fill with syrup leaving 1/2″ headspace. Wipe off the rims, put the lids on and tighten the bands and you’re ready to process! Canning is a little time consuming, but not difficult and the fruits of your labor will look great in your pantry, ready to make winter feel like summer! 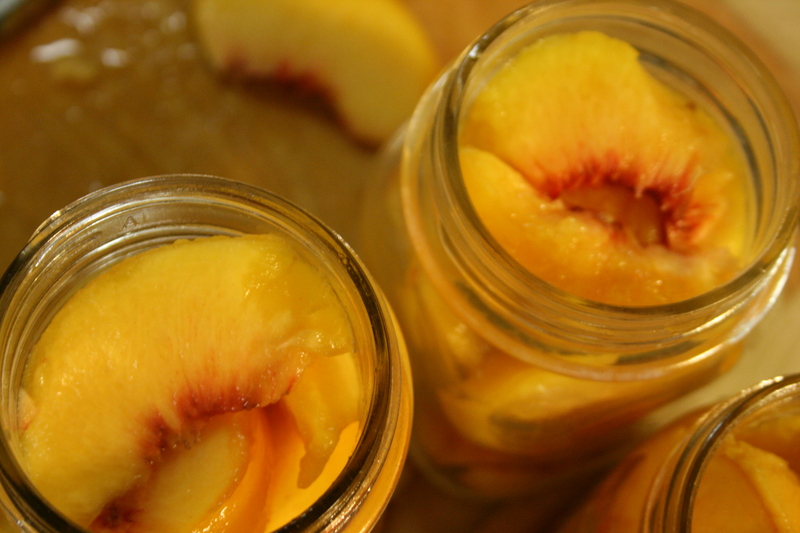 Take the peaches out of the fridge and keep them at room temperature. Blanch the peaches in boiling water for about 2 minutes. When cool enough to handle, peel and slice the peaches. Cut off any bruised spots. Prepare the syrup-in a medium saucepan combine 1 C of sugar for every 3 C of water (doubling this will yield a dozen pint jars)-heat and stir until dissolved and then keep warm. Heat flat lids in hot water in a small saucepan to sterilize, leave in hot water as you use. Put on water to boil in a big pot or canner to process the jars in. 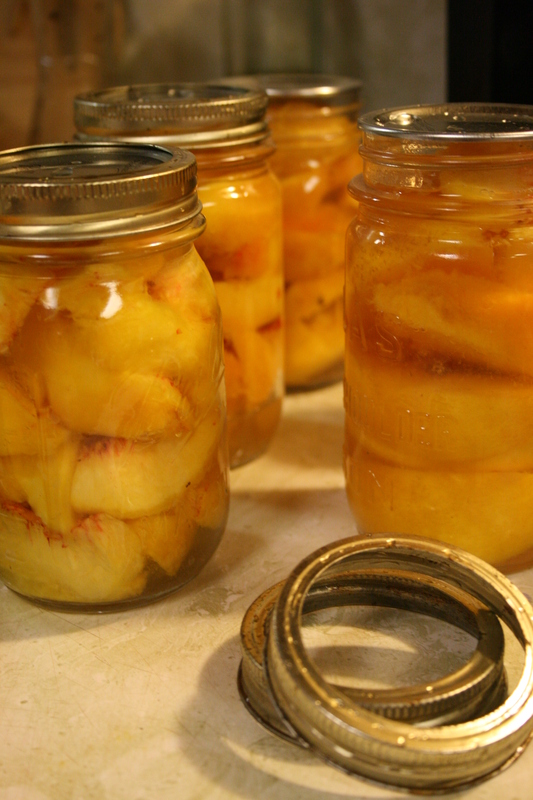 Pack peaches in jar tightly (cut side down if you can), they shrink up a lot when you process them. 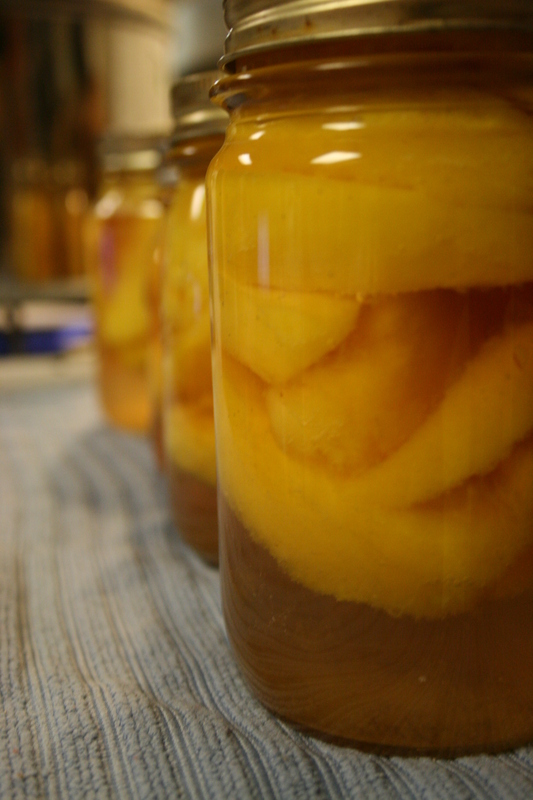 Using a funnel, ladle syrup into the packed jars leaving ½ inch headspace. Wipe jar rims with a clean paper towel before putting lids on. Put flat lids on and tighten screw top bands hand tight. Carefully lower prepared jars into boiling water, covering by an inch. Bring the water back to a boil, covered. Boil pints for 15 mins or quarts for 20 mins to process. Turn off heat. Let jars sit in water for 5 mins. Remove jars from boiling water bath and set on counter on tea towels for 24 hours, undisturbed. You may hear the jars make pinging sounds when the lids seal. If you’re like me you want to push on the lids right away to make sure the canning worked. Don’t. After all this work, you don’t want to blow it at the last minute. After 24 hours, press on the lids to make sure they are sealed down. 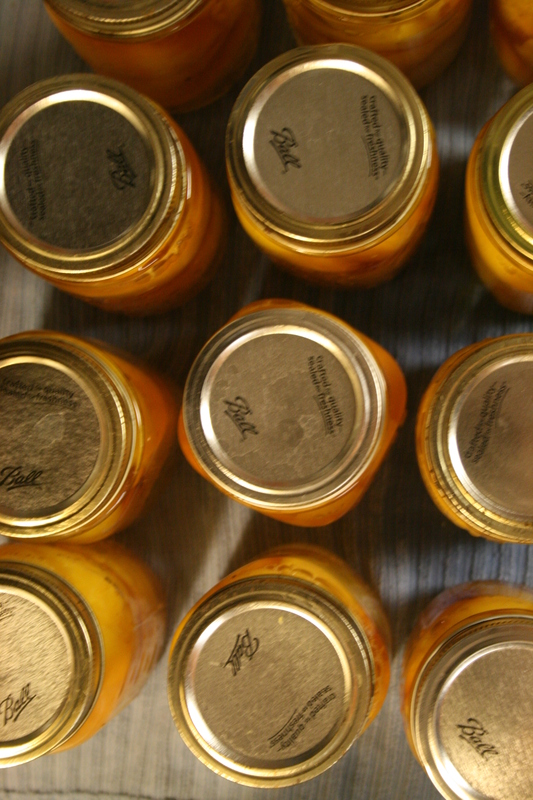 Any jars that didn’t seal should be refrigerated and the contents eaten within a couple of days. You can remove the bands at this point. Wash the outsides of the jars off before storing, as they may be sticky. 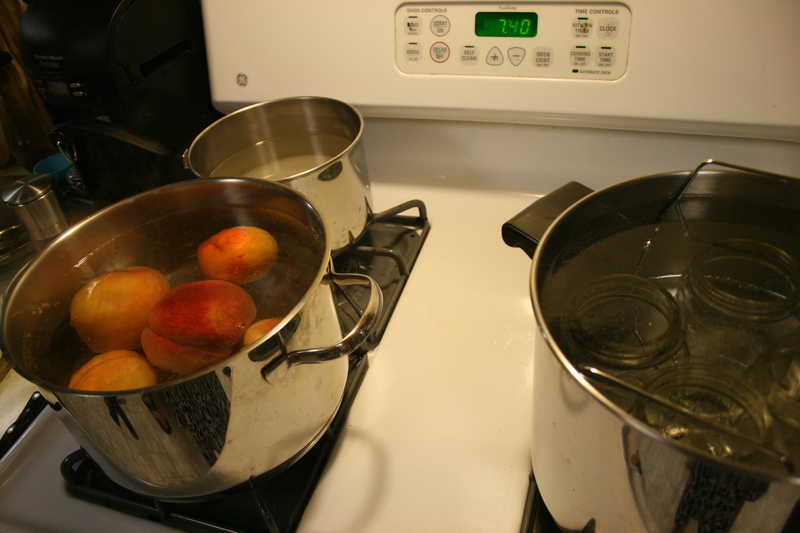 Ball Canning has a nice printable pdf that lays out basic steps for boiling water bath canning for high acid foods (like peaches) here. They also have yummy looking recipe for honey spiced peaches here. Here’s to trying new things. I’m looking forward to tackling some of the other items on The List of Stuff I Want to Cook. Anyone else try anything new they’ve been meaning to try for a while?